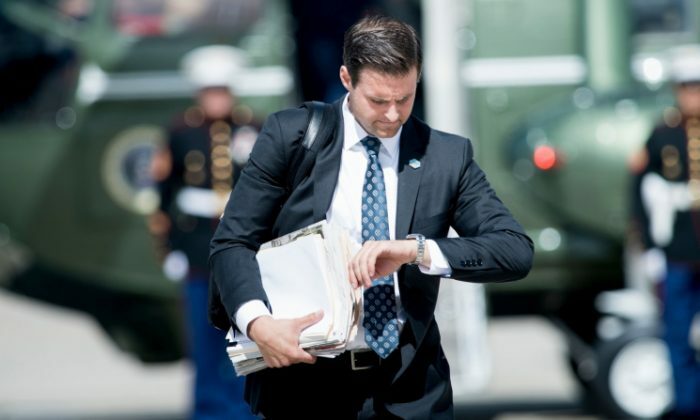 The White House fired President Donald Trump’s personal assistant, John McEntee, on Monday, March 12, Wall Street Journal reported, citing two senior administration officials. “We don’t comment on personnel issues,” White House Press Secretary Sarah Sanders told the Journal. On Tuesday, Trump’s 2020 campaign announced that McEntee will join the effort as a senior advisor. The reelection campaign announced McEntee’s role along with that of Katrina Pierson, the campaign’s 2016 spokesperson. “As we build out our operations for the 2018 midterm elections and the 2020 reelection campaign, we are pleased to welcome back two outstanding members of our 2016 team,” Brad Parscale, Trump’s 2020 campaign manager said in a statement, according to CNN. “We need the help of proven leaders such as Katrina and John to promote the President’s growing portfolio of achievements across the country,” Parscale added. McEntee served Trump since the early days of the 2016 campaign, as part of a tight-knit team including Stephen Miller, the president’s senior policy advisor, Jared Kushner, the president’s son-in-law and senior advisor, and Dan Scavino, the White House director of social media. News of McEntee’s exit landed on the same day as the announcement that CIA Director Mike Pompeo will, once confirmed, replace Rex Tillerson as the head of the State Department. McEntee was present by Trump’s side on a near constant basis. He delivered messages to the president at the White House residence, carried markers for Trump to sign autographs, and, most recently, changed clocks at the White House to adjust for daylight saving time. McEntee told colleagues that the firing was due to an issue with his background. White House Chief of Staff John Kelly imposed a strict security-clearance policy, increasing scrutiny of a large number of staffers who worked on an interim clearance. While in college, McEntee played quarterback for the University of Connecticut football team. He gained internet fame with a compilation of quarterback trick shots posted on YouTube in 2011. The video now has over 7 million views.